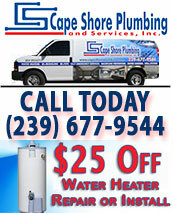 Cape Shore Plumbing, Inc. serves Cape Coral , Ft Myers , Bonita , Estero , Sanibel Island , Naples and all of Southwest Florida . We pride ourselfves on being a family-owned and operated business. It is our goal to fully satisfy our customers from the moment we first answer the phone through completing the job by being prompt, courteous, and responsive to our customer's needs. Call (239) 677-9544 Today! 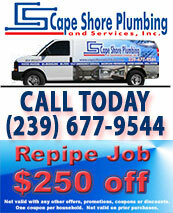 We can help you in your plumbing needs for your kitchen remodeling and bathroom remodeling. Whether it is a new kitchen sink, a new bathroom or maybe it’s a new installation or repair. We can do the job. No job too big or small call us from new construction commercial or residential, remodeling, emergencies, clogged drains, leaking faucets, clogged showers, tub faucets, toilet change-outs to repipe the entire home. Cape Shore Plumbing’s trucks are equipped with emergency parts, and a wide range of specialized equipment for both residential and commercial plumbing needs. 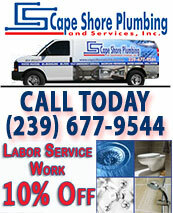 Cape Shore Plumbing has earned and continues to earn the trust of customers, by being committed to good craftsmanship and prompt service.